There is probably at least one field of knowledge in which you are an expert. Maybe it's an area of technology, or perhaps you're the go-to person when it comes to hiking in your local area, creating amazing desserts, or grooming pets. Whatever your forte may be, you can use Wikispaces (free for personal use; paid plans start at $5 per month) to share your knowledge in the world and even create a community of enthusiasts. Wikispaces makes it easy to get started by providing friendly, readable documentation. Many tools let you create a conventional website; Wikispaces is as easy to use as Weebly, but the end result is a collaborative website revolving around your subject of choice. Wikispaces offers a free plan with 2GB of space, which translates to an enormous amount of content. When you open a wiki using the free plan, it immediately becomes readable by the public: Anyone can read it, but only you (and people you choose) and edit and change it. If you want your wiki to be private, you can join Wikispaces Plus for $5 per month. Not being able to make your free wiki private is not a major issue: These days, websites need to work to be discovered. If you're just setting up your wiki and slowly adding content, you can keep quiet about it until you're ready to share it with the world. Chances are almost nobody will stumble upon your exact wiki URL--which takes the format of "yourchosenname.wikispaces.com"--by mistake. 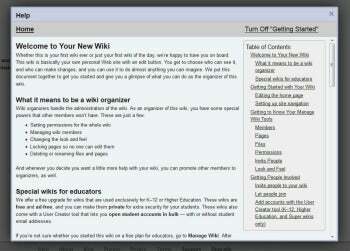 Wikispaces also lets you change the URL for your free wiki at any time, as long as it's under the Wikispaces domain. So you could use a random "staging URL" and change to your domain prefix of choice once you're ready to share. Page templates make it easy to create uniformly formatted topics. The free Wikispaces plan offers a generous feature set. You can choose one of 14 different themes for your wiki, each with a number of color variants. There's a stats dashboard showing graphs for page views, unique visitors, number of edits, and more (paid users can use Google Analytics). 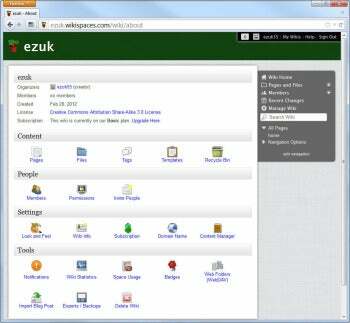 If you'd like to impose a uniform structure for your wiki, Wikispaces lets you easily create page templates. Inviting collaborators is easy, and you can make them either Members ("regular" users) or Organizers (which can invite other collaborators in turn). The Wikispaces editor is visual, so anyone who has used a word processor before will feel right at home--wiki syntax isn't required (although it is allowed). It also has an interesting feature called Widgets that lets you embed rich content from all over the web, so putting a YouTube video or a Flickr slideshow into your page takes just seconds. When I tested Wikispaces, the system felt simple to get started with, but robust enough to serve as the basis for a large-scale project (such as Expedition Earth and Beyond, a NASA-related educational project). If you're looking for a simple collaborative platform that lets you focus on content and forget about server administration and setup, Wikispaces might just be what you need. Note: The Download button takes you to the vendor's site, where you can register to use a this online software. Prices vary by user type (business, education, personal). Wikispaces lets you set up a powerful multi-user wiki with simple editing capabilities--and it's free for personal use.